Crouching behind a wooden bunker your eyes strain to see if there's any movement from the enemy. You can feel the sweat running down your back in the afternoon sun. You're not sure whether they have seen you. Are they being lured into your trap? Still no sound, no movement. Maybe you are being lured into their trap? Maybe they are coming in from the other flank? You shift your weight slowly to the left and gently peek out. Thwwwaaaaaaaaakkk!!! A bright orange splat of paint suddenly cracks against the crate, no more than 5cm from your shoulder. Then another whizzes by. You see the enemy running at you. Rolling to the ground, you lift your gun in front of your face and take aim. Two more bright balls explode just beside you. Fire! Fire! Got him! The enemy holds his hands above his head, a neon-colored splatter in the middle of his chest. It's game over. You've won! You stand up and salute your comrades-in-arms. It is only then you realize that your hands are shaking and your heart is beating like a drum. Whereas our mothers and fathers grew up playing Cowboys and Indians in the streets, kids nowadays have the luck to be born in an age of technology where they can run wild in an enclosed compound and spend hour upon hour of fantasy-fuelled fun, pretending to be Rambo or Lara Croft and killing off their opponents one by one. The concept of the Paintball game was originally conceived in the USA by three men: Bob Gurnsey, Hayes Noel and Charles Gaines. Their intent was to settle a longtime debate about who were more cunning, city slickers or country folk. The first known Paintball game was played in the woods of New Hampshire in 1981, with twelve competitors playing 'Capture the Flag', using simple goggles, CO2 powered 'paintball' pistols and oil-based permanent paintballs, which were originally used for marking cattle and trees. The goal of this original match was to capture all twelve participants' flags, without being 'eliminated' by being shot. On this fateful June afternoon, the eventual winner, country-boy Ritchie White, captured all twelve flags without firing a single shot! Paintball pioneer Bob Gurnsey saw the potential of what went on that day in the woods of New Hampshire and went on to patent new products from the companies that supplied paintballs and markers to forestry and agricultural markets. He then marketed the first Paintball Game field under the banner of the 'National Survival Game'. In 1983, the first official N.S.G. Paintball tournament was held, and the die was cast. 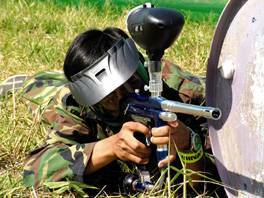 Nowadays, it's estimated that there are no less than 25 million regular paintball players around the world. In the US, every state has a weekly league and national champions include teams with fearsome names - �Adrenalin', �Asylum', �Heavy Duty' and �Femmes Fatales' for starters. Never far behind, Chiang Mai has now entered the Wild West world of Paintball. Thanks to some young entrepreneurs from Bangkok, an 80m by 35m field near Hang Dong has been acquired and built to the specifications of the sport. 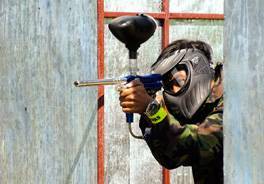 Set in the open air but safely enclosed with plastic netting, the Chiang Mai Paintball Club opened in December and has already attracted a local circle of fans, most notably from the international schools. Competitors are divided into two teams (or you may decide to make your own team of friends or office colleagues) and given camouflaged fatigues to wear, while the organizers explain the rules both in Thai and in English. Combatants are then issued face masks and guns filled with 50 small paintballs (similar looking to bubble gum). Make no mistake, if you get hit, you feel it! You may well be waking up the next day with a small bruise or two. The field is freckled with various 'bunkers' - fences, crates, corrugated barriers - which you hide behind and fire from. If you get hit you must immediately raise your hands in surrender and leave the game. Two referees are on hand to check. The game lasts until one team has been killed off. Games usually last from 10 minutes up to half an hour. After losing a battle, your team can rest, plan a different strategy while enjoying a refreshment in the pavilion, then go back out again and try to win. Depending on how much ammunition you use, paintball should cost anything from 350 baht to 2,000 baht for an entire day of all-out war. 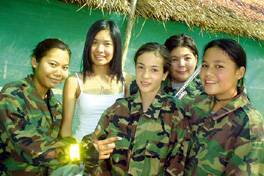 Owner Asa Chanthaworn first became a paintball junkie while living in the USA. Last year he decided that rather than wait, he would open up his own paintball business and considered Chiang Mai to be the ideal spot to start. "We are hoping that this extreme sport grows in popularity here in Chiang Mai until we can form a league," says Asa. "It's a very fast-paced sport, but so far, we have not had any accidents, just bumps and bruises. We take the security issue very seriously. We should be able to bring the price down a bit in the future, because it's not affordable for everyone at the moment. It's great for birthday parties, bachelor parties, office picnics, retirement parties, graduation parties, you name it. And adults love it just as much as kids." So, citizens of Chiang Mai - arm yourselves for the next great leap forward in extreme sports - for Paintball has arrived!